COLORADO SPRINGS, Colo., April 1, 2019 /Christian Newswire/ -- The leader of a think-tank that promotes creative ways of sharing new ideas challenged nonprofit groups to stop talking and put their life-transforming ideas into motion -- with the United Nations World Creativity and Innovation Week about to get under way. "Nonprofits need to move beyond talk and take action if they want to reap the benefits of innovation," said veteran missions and nonprofit leader Jon Hirst, who has worked with dozens of global nonprofits to release their ideas into the world. While the past year has seen a spike in innovation awareness among nonprofit groups, only a small portion are taking steps towards putting their new ideas into practice, said Hirst, co-founder of Colorado-based think-tank Generous Mind and the director of program innovation for SIL International. 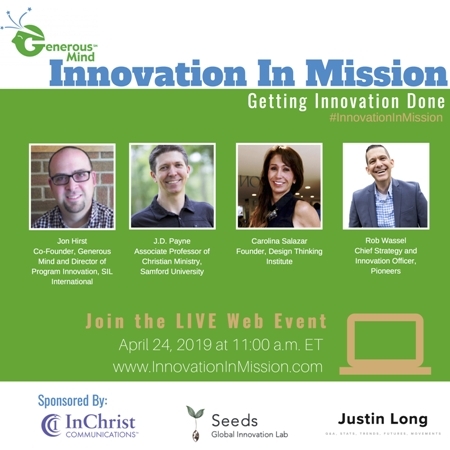 Hirst will host the second annual Innovation In Mission virtual event -- under the theme "Getting Innovation Done: Practical Steps to Innovation in Mission" – April 24 from 11:00 a.m. -- 12:30 p.m. EST, following the UN World Creativity and Innovation Week, April 15-21. Event registration, as well as last year's video, is online at www.innovationinmission.com. The event is sponsored by InChrist Communications (a full-service Christian communications agency), Seeds Global Innovation Lab (a resource to equip missions with biblical design thinking best practices and tools), and The Weekly Roundup by Justin Long (an annotated weekly email that shares links to articles analyzing events, trends, and statistics). The thrust of the online forum is to encourage the development of innovation practices within nonprofit organizations in order to help them fulfill their mission effectively and make an impact on the world. The "innovation industry" in the United States could generate spending and investment of $600 billion by 2021, noted Hirst, but so far only a small number of nonprofits have turned ideas into on-the-ground innovative projects. Keynote speakers will address how nonprofit practitioners can make innovation work and begin to see results. Speakers include Carolina Salazar, founder of the Design Thinking Institute, and J.D. Payne, associate professor of Christian ministry at Samford University. "Innovation becomes practical when it turns into an action with tangible results," Salazar said. "It goes from being an idea to reality." For Christ followers, Payne noted, innovation must be founded on biblical principles. "Without the proper foundation, the Church runs the risk of becoming all things to all people while falling short of its commitment to Christ." Rob Wassel, chief strategy and innovation officer at Pioneers and executive director of the Seeds Global Innovation Lab, will share insights into applying design thinking to the nonprofit setting. Hirst will provide an analysis of Fast Company's "The World's Most Innovative Companies in 2019," highlighting ways nonprofits can make innovation practical. Generous Mind (www.generousmind.com) was founded by Jon and Mindy Hirst to help people and organizations release their ideas to the world. Among the organizations they have worked with are the Billy Graham Center at Wheaton College, SIM International, Acton Institute, Converge Worldwide, the Bible League, the Forum of Bible Agencies, and Bibles for the World. Generous Mind provides innovation program design, cause design, editorial and publishing mentoring, product development and social media strategies.